I could have chosen Histoire de Melody Nelson but I've selected L'Homme a tête de chou (Man with a cabbage head) just for a change. The story of Marilou is on that record, and it's also the voice of my father which I treasure. It's always hard to have your parents as singers - they have a singer's voice and they have their personal, private voice. He hated his voice in the earlier days where he sang much more. This is a real portrait of him; Melody Nelson is a portrait of both of them, and it's a fantasy, and it's different. This one for me is really as original and as melodic and modern as Melody Nelson. You know, 'Aeroplanes' is a beautiful song. He was just brilliant at taking whatever time he needed. Now songs are so formatted, but here there are songs that are seven minutes long. It's a real voyage and a real story. 'Marilou Sous La Neige' is one of my favourite songs because it's so melodic, and he has the most beautiful voice on it. I think it came out in 1976. We were living with a nanny. The cover shot was taken in a garden that wasn't his. 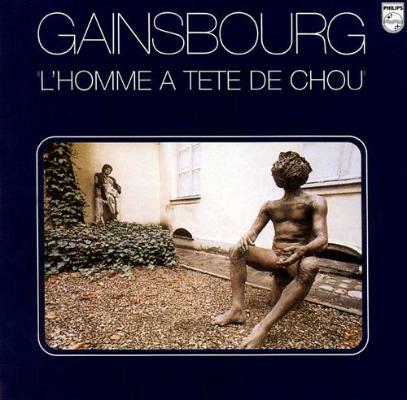 He put L'homme a tête de chou - which was a statue he bought for himself - in the garden and photographed himself with the statue. Now the statue is in his house. I have his house, I bought his house and it's all I have left of him - all his old objects, his whole environment. I guess it's very much linked with this album.